Undoubtedly Iron Man Armor is much stronger than the weak shell of R2-D2. So Mike Verta, a famous digital artist put the ultra armor on R2-D2.In fact, the R2-D2 robot from Star Wars is the result of visual effect. 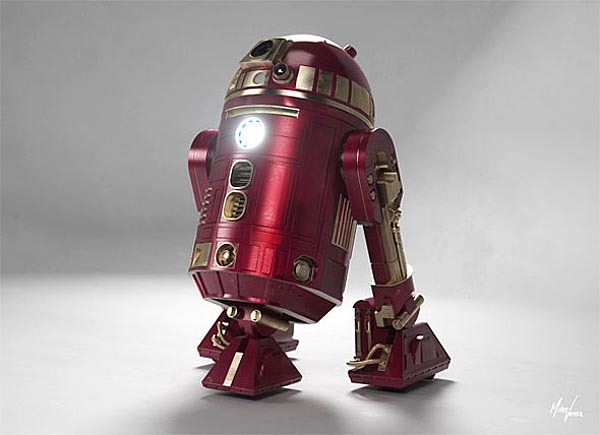 We don’t even see the model of R2-D2 in Iron Man Armor MK X. However, visual effect brought us numerous amazing films, also including Star Wars. Although we have no idea which 3D and visual effect softwares were used by the creator, the unique R2-D2 has told us he did a great job. Did you notice the brilliant Arc Reactor? By the way, the X just shows an unknown Iron Man Armor. Here is another amazing R2-D2 robot.